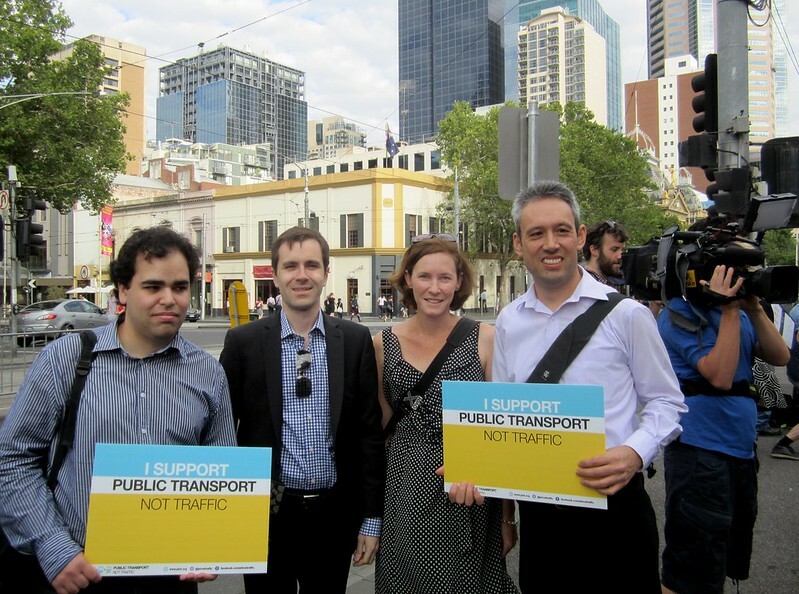 The Public Transport Not Traffic campaign held their PT To Parliament event on Thursday morning. Locals were encouraged to invite their local MPs to catch public transport with them into Parliament House, and discuss PT issues with them along the way. Smartbus 703 (Centre Road) is quite crowded at peak times. Part of the problem is delays on the route due to a lack of bus priority. Also the shortened operating hours and poor frequencies (compared to other Smartbuses) in the evenings and on weekends (including part of the route not running on Sundays) continue to mean patronage is not what it could be, which contributes to weekday parking issues at Bentleigh station. Bus 822 – this currently diverts along side streets between North and Centre Roads, but has long been proposed that it be moved to run down East Boundary Road, to speed up travel, and better serve GESAC (though it already stops nearby, out the back). It’s a mystery to me why this hasn’t happened. Summer train timetables in the past few weeks caused a LOT of crowding on the Frankston line. Thankfully this is over for now, but this left a lot of regular users very angry. Signage – several years after it went out of service, the automated sign for train times outside Bentleigh station still does not work. It’s a little thing, but easily seen as a sign of inaction. Southland station – still no visible progress. I think it’s reasonable to say people had expected more on this by now. Ten minute services – the Coalition has presided over improvements on the Frankston line such that we now get a train every 10 minutes for much of the day, 7 days-a-week. But there has been almost zero publicity around this, and many locals remain unaware of it. I dare say that better promotion of this fact would not only boost patronage, it would also be a genuine good news story for the government. There are bigger issues at the statewide/citywide level, of course, which I’ll aim to cover in a future post. But these are the local transport issues that sprang immediately to my mind. And note — none of them are mega-projects. The most expensive is Southland Station, in the tens of millions of dollars range. Fixing the other issues would be relatively cheap. And other areas have local issues… The PTNT campaign is going to launch something on that soon. But in the meantime, any other locals care to contribute their thoughts? Well done Daniel. I don’t think Elizabeth Miller will be the member for Bentleigh past November, so it probably didn’t matter that she wasn’t there. I also have a gripe with the 703 – as you point out, it doesn’t go all the way to Brighton after hours or on Sundays. This means that I or my wife need to ferry one of our kids to Monash by car (25 minute trip) to avoid her enduring the 2 hours plus ride on PT. Hi Daniel. Just wondering why you never campaign for PT users outside of Melbournes suburbs? What about V/Line travellers? The precious 10 minute service the PTUA campaigned for on the Dandenong line on the weekends was THE SINGLE WORST thing that could have happened for V/Line travellers on the Traralgon line. We now have to be on time to pakenham, within 4 minutes (a feat rather difficult when you’re coming 100-200 odd kms) otherwise we get stuck behind a Metro Pakenham train and are 25 minutes late into southern cross. This makes it impossible to rely on the timetable and i often have to come in 1 or 2 hours early just to make sure im on time for work. This happens regularly over the weekend. At some point you need to realise that Melbournians aren’t the only people in the world. There has been talk of “upgrading” the pakenham line off peak frequency to a 15 minute service Mon-Fri in future timetables. This will no doubt mean the issues myself and others face on the weekends extend to weekdays as well. As usual, those who travel in the peak hours will be catered for. If you’re a shift worker working weekends and outside 9-5, you’re just spit on the sidewalk and don’t matter to anyone. 10 minute timetables, whilst completely unnecessary for Melbourne, may be functional on many Melbourne lines, but those lines that share with V/Line should be completely out of the question (read Werribee, Sunbury, Craigieburn, Pakenham). Please consider this next time you enthusiastically campaign so that someone traveling from Oakleigh only has to wait 9 minutes for a train instead of 19. I live in Oakleigh South, but commute through Bentleigh a lot. The 10 minute train service combined with roomy trains is a great attraction, rather than slogging into the city on a crowded Cranbourne/Pakenham line train. The 703 bus is fine – I know I never have to wait too long for one. The only times I see them crowded is when the school children flood them on the way home. A station at Southland would be convenient, but I’ve filed that in “not in my lifetime”. It doesn’t take too long to walk up from Cheltenham or Highett, and we are well serviced from home via the 631 bus. @Harley, thanks for the comment. Firstly, I am not the PTUA. The PTUA has an active Geelong branch which also attempts to campaign on other regional issues. However, PTUA is voluntary – its strongest campaigns are the ones the active campaigners prioritise. If you think it should be campaigning more strongly in a particular area, then join and get active. I agree with track congestion can be an issue with frequent stopping trains vs expresses (eg V/Line services). Regional Rail Link will take care of that on the Werribee line and much of the Sunbury line. As I wrote a few days ago, high-capacity signalling could also help to an extent. On the Dandenong line, it must be inevitable (particularly if the Port Of Hastings gets developed) that at some stage a government will commit to a big upgrade – grade-separate all the level crossings and provide four tracks so that V/Line trains and other expresses can easily overtake high frequency stopping suburban trains. In the mean time however, V/Line need to be fixing their punctuality problems so they can hit their suburban paths. If they can’t, that’s no reason to deprive hundreds of thousands in the south-east of the services they need. Not sure why you think peak hour is less congested. It’s likely to be far worse than on weekends, with typically two suburban trains about every nine minutes. You might not think ten minute suburban services are important, but they’re vital to address crowding (here’s how it looked before they were upgraded), for quick connections from other services, and to be competitive for people with access to a car. By the way, what do you think of City to Pakenham passengers being able to use V/Line trains? It doesn’t make sense to me — it’s common to hear of people going to Traralgon etc being unable to get a seat until after Pakenham. I suspect it’s a throwback to the days when there were only a handful of suburban trains down that way. @Doug, I think you’ve just described why the Dandenong line should go to 10 minutes on weekdays! Re: Southland and the lack of station, yes, some are willing to walk from Cheltenham station to Southland. But most aren’t – particularly if they also have to walk to their local stations to get on a train in the first place. The 703 is good during peak and inter-peak (weekdays) but falls down after about 7pm, and is pretty poor on weekends (despite regular crowding between Clayton and Monash). i agree with pretty much everything you say, except having the 822 divert down east boundary road. The bailey reserve stop is just across the park from GESAC, so i just think better publicity and signage is needed. As Author of http://www.fight for smart bus.info I am passionate for expansion of the Smartbus network, including the 703, and have other routes upgraded as well such as the 630. I would also advocate to divert the likes of #822 via Warragul road to avoid the level crossings in the area. Rumor is strong that the next grade separation project shall be the one in Bentleigh. While it may help with some bus routes like the 630, it is none the less a major road improvement being done in your area. Daniel, in your views, how would the grade separation of, I think North road improve the local bus network? Also, it was said that it may need to be done with the rail line going under. Dispite that option costing so much more than building the rail line over the top. It is said that is how the public prefer it to be done. Me, I prefer money to spent more wisely, and give me a train journey that is more fun at the same time. Also from a good source is, they are plan to tackle the whole section between Caulfield and Oakliegh in one go, including complete reworking of the rail line with four tracks, bit like East Richmond. Except in this case the two middle tracks shall be dual gauged and may be not electrofied. To be used for V/Line and freight trains only. Another issue to add to the list: grade separation. This is important not just for motorists, but also for public transport users approaching the station. It can take 10-15 minutes or more to travel a few hundred metres towards a railway crossing in peak hour. As public transport planners find ways of squeezing more capacity into the system, delays near stations escalate. Imagine how long the boom gates would be down during the morning peak at some stations if, as mentioned in your recent blog, signalling reforms allowed 50% more trains through! Premier Napthine quoted a reliability figure of the Frankston line as around 60% under a Labor government, but around 90% under his government. It may be true, but I know public transport figures can be easily manipulated. After subscribing to Metro Trains and V Lines Twitter feeds, most of the problems seem to be about signalling, which possibly would not be a problem if the system you mentioned in your last post was implemented. It may be a step towards driverless trains, but I can’t see why that could not work, as it does in other countries. I won’t hold my breath on driverless trains for Melbourne though. After reading the back and forths about the East West Tunnel, I am quite convinced the money could be better spent on public transport. The $8 billion tunnel is surely only to benefit freight movement. @declan, that’s a fair point that the bus already stops near GESAC. It doesn’t mean it shouldn’t move out of the side streets though. They slow down the bus, adding to the journey length for through passengers. The current route is also beyond convenient walking distance for a lot of people who live closer to East Boundary Road, including the new estate behind Valkstone Primary. A similar debate is taking place around Melbourne… hmm, might be a good topic for its own blog post! @tranzitjim, no, the 822 should not divert to Warragul Road. That’s a long way off the current route. The aim is to get a grid of NS and EW routes running so all areas are served. @DD (and @tranzitjim), I deliberately didn’t include grade separation in my points, because although I’d like to see them all done, I don’t see any in the seat of Bentleigh (including North Road) as high priorities. Murrumbeena would have to be the most important nearby, and those others along the Dandenong line… as well as several dozen others around Melbourne which are more important. That said, Bentleigh has safety issues. A lot of that would be resolved by relatively cheaply by reinstating the pedestrian subway. @Jason, it’s a well-kept secret… and I simply don’t understand why that’s the case. People love it when they hear about it (if they are on this line and can use it). Agree with all of Daniel’s points in the original post. @Daniel – agree that V/Line services should not be made available to travellers between Pakenham and Melbourne. Bentleigh’s subway cannot be reopened, under Disability Discrimination Act requirements. The ramps are far too steep by modern standards and any reopening project would probably cost $5-10mil, plus whatever would be needed to rebuild the platform entrance. When Ormond’s grade separation was being designed, the option to drop the road into a cutting had very strict limits on the western boundary of the project, to ensure that the ramps up to the platform would not be touched by the construction crews. If they were, the whole lot would have to be scrapped and rebuilt, as it would lose its “Grandfather Clause” rights to exist. Re Southland station, I wonder if a short-term marketing strategy would be to rename Cheltenham station as Cheltenham-Southland, in the same way that Jolimont is not Jolimont-MCG; Caulfield is Caulfield (Racecourse) and Royal Park is Royal Park-Zoo. That would raise the general public awareness that the option exists. Southland shopping centre is so large that I doubt most people consider it to be a distinct location separate from Cheltenham, so it might not be a natural link to think of Cheltenham as the place to get off for access to Southland. @Declan, rerouting of the 822, as Daniel said, would speed up the service. I haven’t done the math, but it’s possible that the faster trip end-to-end would allow the same number of vehicles to provide a better service; perhaps every 20 minutes instead of every 30. If that worked out, then people on the section along the back streets would have a shorter average wait time, partially compensating for the longer walking time. It doesn’t quite balance out on its own, but the benefits to other users of the route would likely be enough to make it a worthwhile change. @Jim, I’ve heard Ormond, although I’m hoping none of the crossings are separated until the designs are done correctly. Vicroads does a good job, but PTV/DoT/etc are asking for the wrong final rail design – number of tracks, platforms etc. Yes, rail-over is about 1/3rd the cost of rail-under with all else equal. A rule of thumb supplied by Mr Lezala was that if a project costs $1 at ground level, it will cost $3 for elevation and $10 for a tunnel/cutting; there are other benefits, in that an elevated structure will usually give shorter ramps to the new track height (a train cutting needs to be about 10 metres deep; a train bridge needs about 5-6 metres clearance underneath). I think the only thing we can do is wait until St Albans station / Main Road is grade separated; last I checked the plans there were for rail over with the road unaffected; partially due to the steep gradient on the Sunbury end of the station, but I suspect this is also because it is in a safe Labor seat and therefore it is a good place to experiment with a design that will be unpopular. At Ormond, the only two buses affected by any grade separation project are the 625 and 630 routes. The 625 currently runs about halfway between Glenhuntly and North roads, more-or-less along the Rosstown alignment. It then diverts south to meet Ormond station. The 630 runs right along North Road. c) the routes would both have to be severed at Ormond. If the rail is placed under and there are no changed to the road system, then the buses would be unaffected except that the bus stops could perhaps be moved closer to the platform entrances. @DD, a study a few years back predicted that by 2018 with current infrastructure, Hughesdale station / Poath road would be the worst level crossing in Glen Eira; closed for something like 38 minutes of every hour, IF everything runs to time. You’re right; the only answer is grade separation. @Andrew, driverless trains work best in, say, an underground system where most variables can be controlled. I don’t think any of them operate in an area with level crossings or the risk of a car falling into the cutting and a train crashing into it, as happened near Lilydale a few years back. I gather the intermediate step in the technology is planned to be a system without signals, where trains automatically check the track ahead and set a maximum safe speed limit which the driver then has to obey. The next step after that will be to shift those functions to the computer, leaving the driver responsible for doors, telling the train when to go, emergency braking if necessary and waving to people on the platform (IIRC some “train drivers” in Japan are hired exclusively for those functions). As for the East-West road tunnel, nobody’s really sure why it’s being built. There is obviously a push for its construction, possibly within the engineering industry, as an employment project. But nobody’s been able to adequately defend its construction from a transport perspective. @Harley – regarding regional services versus 10-minute services in the suburban area; it is nearly possible to operate both a ten-minute suburban service and a 20-minute V/Line service with existing infrastructure, there are a handful of bottlenecks that need to be fixed before it can be made to work reliably. RRL’s new tracks between Sunshine and Southern Cross fix about half the problem; Deer Park West to Manor Junction, the north-south section through Tarniet, would have been optional if that area did not require a rail service on its own. A third platform at Newport would probably have been enough to fix congestion on the Geelong route in the short term, though eventually further tracks would have become necessary. Notably the original plans for the RRL allowed four tracks from Sunshine to Wyndham. Only two are being built now, although some structures, such as platforms, are being spaced to allow for extra tracks to be added later on. a) Deer Park West junction (intersection), where Ballarat and Geelong trains split. If the timetable doesn’t match perfectly one train might have to wait for another to pass, instead of the bridge which was originally going to be provided. This could give delays of four minutes or so to any train kept waiting because of this. On the other hand, the junction design is for 160 km/h running on the Ballarat route but 65 km/h running on the Geelong route. Given that 80 km/h tracks are easy to provide in the exact same area and are only slightly more expensive, this feels like a “salami tactics” procedure – build the cheap version first, then when it quickly becomes a problem you get more money to fix the issue. The same thing happened at Craigieburn, which has been “finished” three or four times now and still doesn’t match the original overall plan (which included a third platform). The rail bridge will probably cost something around $80mil. The money “wasted” on the 65 km/h track components is probably quite minor, maybe a few million at most including signalling. b) Sunshine junction, where Ballarat/Geelong trains meet with Bendigo trains. This area has a lower speed limit overall so the delays associated will be considerably less than at Deer Park (less slowing down / speeding up time). To get a better end-result would have been far more expensive, with a complete deletion of Sunshine station and the Hampshire Road bridge. Given the proximity of the curve to Ballarat the station would probably have to move south by something like 200 metres, giving a longer walking time to all the local shops. The project would have cost quite a lot more. Based on the magnitude of works in comparison to the average grade separation project, an ideal Sunshine design would probably have worked out to half a billion dollars. The rebuild we’re getting instead is on a much smaller scale, and the costs involved in delayed trains are minor when compared to the price tag to fix the problem – at least for now. c) The link between the RRL tracks around South Kensington / Moonee Ponds Creek, through the middle of Dynon yard and onto the rail bridge on the Melbourne side of North Melbourne station. This link has two flat junctions (rail intersections) – one under Citylink and another immediately adjacent to the North Melbourne bridge. I was not able to get accurate measurements of Citylink’s height, but I did come up with a concept that could have avoided both these problems if Citylink is high enough (as I suspect it is, but I haven’t been able to prove). The concept was for a long bridge to be build from the edge of the North Melbourne flyover, one track either side of the ramps that bring those rail lines down to ground level before they cross the Moonee Ponds Creek. Those lines would then run along the current power line alignment between the Citylink offramp to Dynon Road, and the Creek, staying elevated with a complete rebuild of the high-level tracks over the Creek. The raised tracks would then fall back to ground level fairly close to South Kensington station. This would have been massively expensive, so perhaps the cost would have outweighed the benefit (although I am not convinced). Similarly, it is possible to run 10-minute suburban and 20-minute V/Line services with existing infrastructure. The one exception is at Broadmeadows, where a further crossover is required allowing citybound trains to cross over to Platform 2, allowing the V/Line train to run through on Platform 1 (about $30mil). With this extra trackwork, the system would have each citybound suburban train stopping for three minutes at either Broamdeadows or Essendon (half each). On the outbound journey, every second suburban train would have to wait at Essendon for three minutes, but no delays would be necessary at Broamdeadows (because the steep hill of the line means V/Line expresses aren’t much faster than suburban trains, and they won’t catch up). In practice I think the ideal short-term solution would be to operate hourly Seymour services using one of the three slots in the timetable; the second slot would be made available for Shepparton trains, which could then run express between Craigieburn and Seymour. Like the 822 bus above, the accelerated timetable would mean fewer trains would be needed to provide this service. In fact, with an additional passing loop, about 3km long and just south of Murchison East station (involving the deletion of one level crossing), it would be possible to run trains to Shepparton every hour. The third Craigieburn-Melbourne express slot could be used for peak hour suburban trains (over the 10-minute service), or for freight or empty carriage transfers to/from the workshops at other times of the day – although freight trains might need additional engines to maintain a higher speed. Once RRL is completed, this section will be the worst bottleneck on the entire Victorian network. The Metro Rail tunnel running under Swanston St (from Footscray to Hawksburn) will do ABSOLUTELY NOTHING to fix the problem, and in fact it may make the problem worse. The only answer is to finish the plans for the tunnel, then leave them in a convenient drawer to be modified and reintroduced around 2025-2030 (probably as a real “metro” concept as understood internationally, linking our two most-Metro lines to Upfield and Sandringham with the tunnel linking Jewell to Windsor). There is only one way to solve the Caulfield group’s bottleneck, and I have figured out a project that will solve this problem as well as allowing ample capacity for Hastings freight services, Rowville suburban etc. 1. Pakenham – City*; running express Dandenong-Springvale; Oakleigh-Caulfield-South Yarra, running every 10 minutes on average. 2. Cranbourne – City*; running express Springvale-Oakleigh-Caulfield-South Yarra, running every 10 minutes on average but with half of all trains terminating at Dandenong instead of running Dandenong-Cranbourne, due to single track restrictions. 3. Rowville or Westall; stopping all stations, running via City Loop, every 10 minutes. 6. Stony Point – Frankston, running hourly. 7. V/Line trains to Traralgon; maximum 20 minute frequency, in practice hourly to Warragul express Pakenham-Dandenong-Caulfield-Richmond; hourly to Traralgon express Warragul-Pakenham then as above to fit the 20min cycle, and Bairnsdale running express Traralgon-Warragul-Pakenham then as above, a few per day with excess paths to be made available to other services, similar to Craigieburn spares as above. 8. Freight/other paths; three per hour, running from Dynon yard (splitting just south of Southern Cross station) to either Dandenong South or Port of Hastings via Frankston. *For the sake of simulation, I had Frankston running to Craigieburn; Cranbourne/Dandenong running to Williamstown and Pakenham running to Werribee, the latter express North Melbourne – Footscray – Newport – Laverton, with an additional 20-minute shuttle service between Newport-Westona-Laverton. 1. $80mil – Flyover at Richmond, between the William Barak bridge and Batman Avenue, linking Richmond Platform 6 to platforms 8/9 at Flinders Street without blocking moves between platforms 3-4-5 at Richmond and 6-7 at Flinders Street. 2. $10-20mil – Resignalling between Richmond and Caulfield on the centre pair of tracks only (leave the outside tracks as-is), to convert from alternating direction so that the two northern tracks are for outbound trains and the two southern tracks are for inbound trains. Contrary to the practice employed at East Richmond, the express trains would run on the outside tracks and stopping trains would run on the inside pair. 3. $150mil – Construction of a second track between Tyabb and Long Island Junction on the Stony Point line, to allow for the increased train service as well as closer-scheduled freight trains. Both tracks would be signalled for movements in both directions, to allow parallel running of fast (Sprinter) and slow (freight) trains if necessary. 4. $50mil – Addition of “turnback” sidings at Pakenham, between the two mainlines on the Traralgon end of the passenger platform. These sidings would allow a suburban train to offload passengers, shunt into the siding to allow a V/Line train to use the same plaftorm, then pull out into the other platform when it’s time to depart for the city. I expect two sidings between the tracks would be sufficient. 5. The major part of the project: a sum of $2.65bn spent grade separating Grange Road, Koornang Road, Murrumbeena Road, Poath Road, Neerim Road, Glenhuntly Road, North Road, McKinnon Road and Centre Road, as well as the necessary closure of the Queens Avenue underpass immediately southeast of Caulfield station. The result of the project would be that the four tracks through Caulfield would each split into two, giving a raised track towards Dandenong and a lowered track towards Frankston. A short 150-metre section of steep track (about 1:35 gradient) would exist for the middle six tracks (but not the outbound Dandenong Express or inbound Frankston express) before the bridges where the Dandenong tracks would pass over the Frankston tracks; this is why the Queens Avenue underpass must be deleted – it is in the way and there’s nowhere else for it to go. One option would be to build a Horseshoe bridge, like the one at Perth station, over the south end of Caulfield’s platforms. After Caulfield there would be four tracks running to Warrigal Road, Oakleigh and South Road, Moorabbin; the boundary of the project would be those two road bridges. Carnegie, Murrumbeena, Hughesdale, Glenhuntly, Ormond, McKinnon, Bentleigh and Patterson stations would be completely scrapped and rebuilt with four tracks, but only a single island platform in the middle for each. Express trains would run on the outside. On the Dandenong line, foot crossings would be retained at Cosy Gum Road, Ella Street and Richardson Street. Blackwood St’s footpath near Carnegie would be replaced with a structure at Hewite Road, about 200 metres further from Melbourne. Neerim Road’s two halves could be connected properly, with the Neerim / Murrumbeena Road intersection south of the level crossing being replaced with a normal four-way intersection. Entrances to Murrumbeena Station would be on both sides of Murrumbeena Road for the 822 bus, and both sides of Neerim Road for the 624 bus. Similarly, Carnegie and Hughesdale platform entrances would be respaced to provide the best-possible access to the adjacent bus stops. On the Frankston line, Moodie Street and Wattle Avenue foot crossings would be grade separated; a new footpath would link both halves of Lord Street and Murray Road, and the Oakleigh Road and Brewer Road bridges would need to be completely replaced. Again, the entrances to Glenhuntly, Ormond, McKinnon, Bentleigh and Patterson stations would be altered for the best-possible spacing. I have analysed options for either elevating or sinking all seven affected stations (Patterson must remain on an embankment). By far the best option would be to elevate all of them, which would be the cheapest and maintain the best-possible gradients for freight trains, but as @Jim mentioned previously that would be politically unpopular. The second option would be to elevate all except Hughesdale and Glenhuntly, which could be placed in cuttings. Other options are available, although they are decreasingly-ideal for freight trains. If, at Caulfield, the Dandenong line is dropped and the Frankston line is elevated, then there are only two options for ideal gradients on the Frankston line – elevate Ormond, McKinnon, Bentleigh and either raise or drop Glenhuntly – and NO ideal gradient options for the Dandenong line. 6A. $150mil/optional – if Rowville line is built, then it is necessary to extend the third and fourth tracks from Warrigal Road, Oakleigh, to Huntingdale. This could be achieved either by converting Oakleigh platform 3 into an island with Platform 4’s track cutting right through the carparks; a flyover or flyunder between there and Huntingdale so that the four tracks each serve both the Rowville and Dandenong routes. 6B. $50mil/optional – The alternative would be to restore the middle track between Platforms 2 and 3 at Oakleigh, and the former track adjacent to Platform 1 which allowed steam engines to move to the other end of the train. The track was removed by 1922 but the alignment is still present, and it would only require a new bridge on existing abutments over the south side of the passenger underpass. Then, reroute the buses in the local area such that Huntingdale, not Oakleigh, becomes the main interchange. Express trains would then run Caulfield-Hutingdale, not Caulfield-Oakleigh.